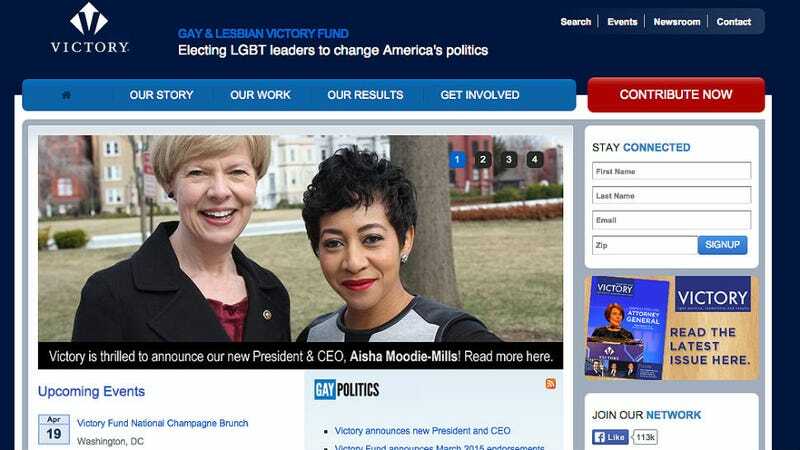 Aisha Moodie-Mills is the new president and CEO of the Victory Fund and Institute, a leading LGBT political organization, and the first black woman hold the position. A mainstay on MSNBC's circle of commentators, she was previously a Senior Fellow and Director of the FIRE Initiative at the Center for American Progress, where she explored the intersections of race, class and sexuality. According to BuzzFeed's Chris Geidner, Moodie-Mills' "presence as a black woman stands in contrast to the predominantly white and male makeup of these groups." "Victory has been thinking about this, certainly before me, and I think I am a manifestation of the forward-thinking of the organization, and that's a great legacy to be able to build upon," she said. "I was impressed that they, as a … not really diverse group — there are only like a handful of women and everyone there is white, so they're not a very diverse group — how they came to it themselves that they need to do something different and that they needed to think much longer into the future — a 20-year plan — and that this 20-year plan needs to reach people that they've never reached before." Moodie-Mills' wife is Danielle, who tweeted the announcement adorably on Thursday. Image via the Victory Fund and Institute.